From mid June to mid July I will be an artist in residence at the Kala Institute of Art in Berkeley, CA. The plan is to make quite a few editions of lithographs and screenprints incorporating digital printing. For those feeling generous (or those wanting to pick up some artwork on the cheap) please visit my Kickstarter campaign page. 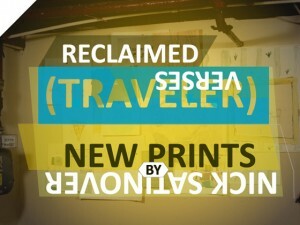 The project is titled “Reclaimed Verses (Traveler),” and will be in direct response to the experience of traveling and making work in a new environment. Also; for those in the Dayton area, stop by Ghostlight Coffee and take a look at “Basement Occupation,” a casual exhibition of works on paper by yours truly.